I would like you to know I have just returned to the Office from the protest. On very short notice about 200 people showed up. They included about 40 people who were either players in the orchestra, soloists who have recorded CDs with the orchestra or composers who have been broadcast and/or recorded bu the CBCRO. 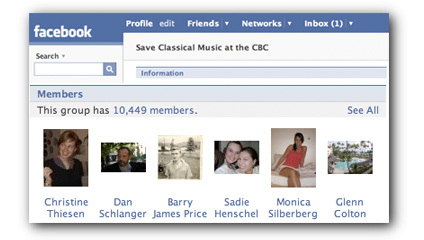 The UBC School of Music cancelled classes so that faculty and students could attend and many did so. About 25% of the crowd were CBC listeners. The group sang protest songs and gathered in a circle outside the CBC building entrance and sang O Canada. This was also beautifully anarchic and leaderless and the group endorsed the idea of singing and then each person covering their mouths as a sign of this suppression of free expression. The CBCRO is Canada’s most important platform fro presentation of orchestral music by Canadian composers. last year for example in theri 7 public concerts they commissioned 18 Canadian composers. This is a national treasure and the restoration of this treasured ensemble is an issue much bigger than the orchestra or classical music or Radio 2 or public broadcasting. This issue is at the heart of what it means to be canadian in the 21st century.